Ah yes! Who can forget the days long before the state takeover that bus watching was a variety of makes and models with some unique to the fallen flags that are now nothing more than a distant memory. I remember my high school days in the early 60's when me and my trusty bike will trek south from my Mineola home and spend hours at the old Hempstead Bus Terminal. Everything from Macks and GM and an occasional Transit bus kept that terminal a busy place. My favorite coin shop was there and who could forget that icy glass of orangeade from Nedicks? 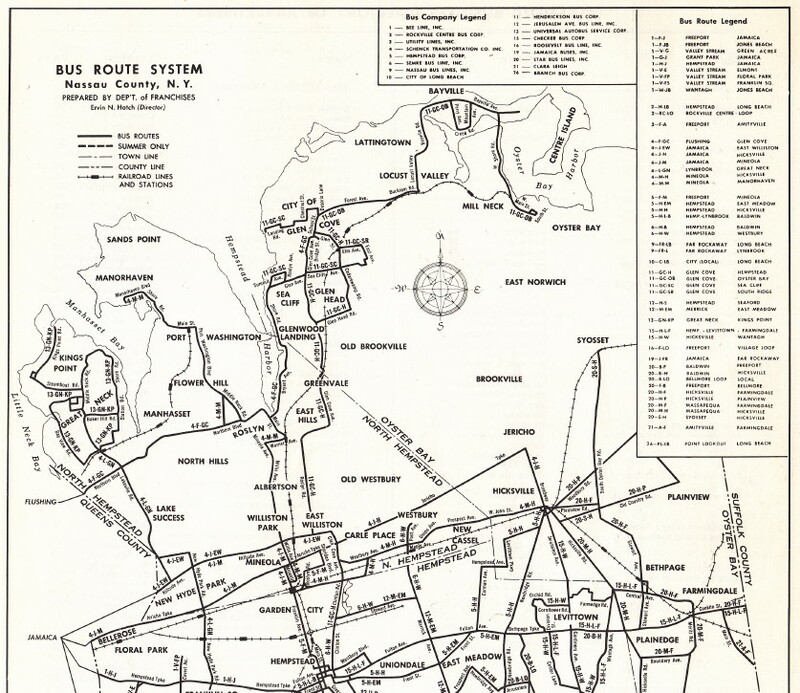 Scanned is a system map from 1960. Check out all those bus companies. Too big for my scanner, I had to divide it into two parts. Many thanks for posting these maps. I have long been concerned that northeast Nassau County has been weakly served, but Northern Blvd and Cedar Swamp Road now gets served from Great Neck, albeit with only college stops. That is, there is Greenvale-to-Hicksville service. That's an addition to 1960. An inconvenient subtraction is the removal of Bayville service. Sometime ago, I learned of wartime routes bringing workers to the airplane factories, but certainly the lines criss-crossing East Meadow and Levittown hardly existed before suburban sprawl. 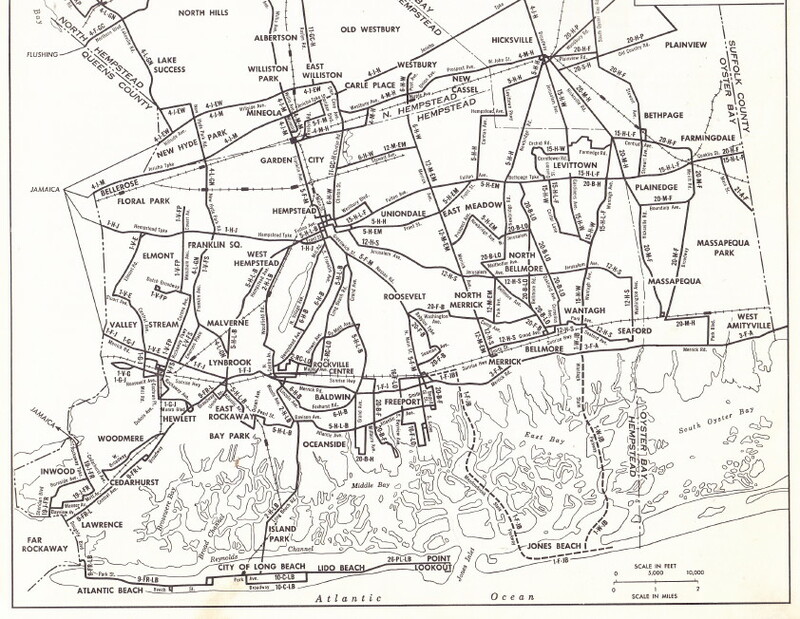 Many roads radiate from the business districts of Hempstead, Hicksville, Valley Stream and Rockville Centre, presumably in existence fifty years before bus travel was introduced. It would appear that the N80 and N81 were at that time operated by Star Bus Lines. One of those two routes from Hicksville met Utility Lines near the Bar Harbour Shopping Center.. In July of 1960, I made four trips on Utility Lines there during a railroad strike. I can make out a few former streetcar lines on the map, probably established fifteen years before the muddy roads were macadamized after the Great War. Posted: Fri Dec 30, 2016 1:47 pm Post subject: 1960 Map. The map shows Star operating a Freeport to Baldwin service by way of Bay Colony. This was a brief effort by Star in the early 50,s,then Hempstead Bus took over service from Bay Colony to the R.R. Station.This was the original Mack Bros. route. HB ran it right up to the 60's as I recall....Perhaps Star returned to the scene with the route as shown.I will stand corrected if more info.is provided....Bob. Very interesting map...thanks for posting it.